Lose Weight The Diet Center Way! Your local Diet Center is the perfect choice for losing those unwanted pounds and inches. Our professional weight loss counselors will help you reach your weight loss goals with innovative programs supported with one-on-one counseling. Whether you want a diet plan focused on traditional meal preparation, the convenience of nutritious meal replacements or the special advantages of supplementation to help support fat burning and appetite suppression, we have what it takes to help you reach your weight loss goals. Proven programs and proven results. Click the pink button to your right to find a Diet Center near you. Diet Center has earned a solid reputation for helping people achieve weight loss success with four unique diet programs and innovative diet products to support your personalized weight loss and weight management goals. At your local Diet Center, you'll receive caring one-on-one support from weight loss professionals who understand that when it comes to weight loss, one diet does not fit all. Your Diet Center Counselor will help you define your personal goals then help select the right diet plan for you then select the weight loss strategy that's just right for you based on your specific goals and lifestyle. Each of every Diet Center weight loss plan includes nutritional supplementation -- vitamins, minerals, fiber, protein -- to help support specific needs ... and no matter which plan you choose, you'll receive our exclusive exclusive Diet Center Chewable Supplements, the secret to weight loss success. This very special supplement will help curb your hunger by stablizing blood sugar levels, help your body metabolize proteins, fats and carbohydrates more effectively, and provide much needed energy while you are dieting. We will also introduce you to our family of Diet Center weight loss products, most of which can be incorporated into any of our diet programs. Best of all, you'll get one-on-one support every step of the way through the four key phases of weight loss: conditioning, reducing, stabilization and maintenance. But it doesn't stop there. Once you've reached your weight loss goals, you'll be armed with Diet Center's tips, tricks and guidance to help maintain a healthier weight for life. 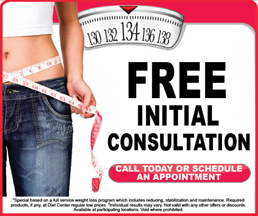 It all begins with a free consultation at your local Diet Center. Why not get started today? No center in your local area? Learn more about Diet Center's online program options by clicking here.